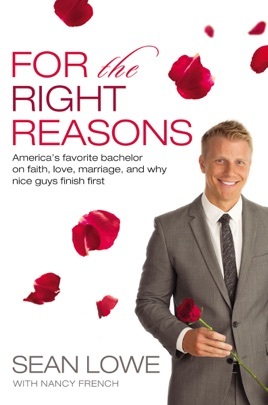 The “virgin Bachelor” Sean Lowe reveals the challenges of finding love while championing his Christian convictions in the morally complex world of reality TV. After The Bachelorette broke his heart, Sean Lowe suspected his “nice guy” image hurt him. The show never emphasized it, but Sean committed to living according to biblical standards of sexuality, even as producers emphasized the risqué and promiscuous. A Texas boy from a Baptist home, Sean tells the story of how he went from a Division I college football player to a fan favorite on reality television, taking readers behind the scenes of The Bachelor and The Bachelorette to see the challenges of living out his values and faith—and ultimately winning his true love’s heart. For the Right Reasons is about the journeys we all have to take in the real world, where being “good” is the right thing to do but sometimes doesn’t seem to be enough; where betrayal is commonplace; and where that thing called perfection is actually just a cruel myth. Sean learned a few things from his two seasons on the hottest romance shows on television, and he wants others to benefit from those lessons: good does eventually win, lies will be discovered, and “nice guys” do ultimately finish first. I absolutely loved this book! I was so sad to finish it! I didn't want it to end! I hope he writes another one about how his life is going now! I was very surprised with this book. It was an excellent, well-written story about life and living for God. As someone in their mid-20s, I was very inspired to read about someone else who is living their life for God even though other people may not understand it and may think it's weird. I loved how it is a story about being faithful in the little things since that is what I am going through right now. I would highly recommend this book to anyone looking to be encouraged. Such a great book! Loved the honesty and the "behind the scenes" Bachelor/Bachelorette parts.